A local theatre group is ready to bring a short story by Patrick White to life on the stage. It’ll be the first time the late author’s work has been adapted for the stage. Actress Anna Brockway is one of the many talented actors signed up for the production, she’ll be appearing alongside some of Perth’s best known actors. “It’s a nice group and there are great creative people involved as well.” Brockway said. The combination of great actors, respected collaborators and a brilliant script is something Brockway said was a big attraction for signing up for a role in ‘The Cockatoos’. Kingsley Judd, Janeyt Pettigrew, Nicola Renton and James Sollis will join Brockway on the stage, while behind the scenes choreographer Claudia Alessi, composer Ash Gibson Grieg, sound designer Will Slade, lighting designer Tegan Evans and set designer India Mehta all bring their special talents. The production is lead by Andrew Hale, who adapted the work for the stage. Brockway said the intimate setting of The Blue Room suited the show well, and even though a lot of actors are involved a minimal set gives them plenty of room to move. “It’s an Australian story and a really interesting one by an amazing writer.” Brockway said. Brockway said White’s novella, that was published in 1974 was an intricately written work that almost had the stage directions written into the story. Brockway agreed that White’s writing style was often complex, but it transfers well to being a theatrical work. In the production Brockway plays a single woman whose mother has recently passed away, giving her some new freedom in her life. ‘The Cockatoos’ in at The Blue Room until November 7th. 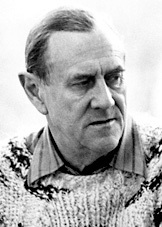 Patrick White is the only Australian author to have won the Nobel Prize for literature, an honour he received in 1973. He published his book of short stories, including ‘The Cockatoo’, the following year. During his career White wrote 12 novels, 3 short story collections and eight plays. He was born in England but his parents moved to Australia when he was just six months old. White served as an intelligence officer for the British Army during the Second World War and was posted to the Middle East. Here he met Greek army officer Manoly Lascaris, the two became a couple and remained together until White’s death in 2003. White and Lascaris were famous for throwing dinner parties at his home in Centennial Park Sydney to which they invited intellectuals, painters and writers to attend. White was known to regularly break off friendship with people he didn’t disagree with or critics who didn’t praise his work. He was political, returning his Order of Australia medal when the Whitlam government was dismissed, and later in life he was a vocal opponent of Uranium mining. Among White’s most revered works are the novels ‘Voss’, ‘The Eye of the Storm’, ‘The Tree of Man’ and ‘The Living and the Dead’.